A definition typically requires a narrow focus and a precise description. However, Fishkin takes the opposite approach in his attempt to define tangible user interfaces. Perhaps part of the challenge in narrowing the scope of TUIs begins with the first word of the acronym. He calls the word “tangible” “a multi-valued attribute” (Fishkin, 348) and, in an attempt to improve the TUI’s broad definition, he developed a taxonomy with two axes. Throughout Fishkin’s article, I thought about various TUIs and realized that most of what existed when this article was published were either art forms or items of practical use; nothing stuck out to me as an everyday, useful, and enjoyable product. While a TV remote is incredibly useful, it’s only relevant when you’re watching TV. Most of his other examples attempted to bridge the gap between motion and engaging some aspect of our senses (i.e. movement and increasing a sound or a situation where rotation changes what one sees on a display like in the Great Dome example). When I think of a TUI, I think of something that’s useful and practical in our everyday lives. While this use case may not have always been true, I believe the start of these practical and enjoyable TUIs began with products like MP3 players which first debuted in 1997. 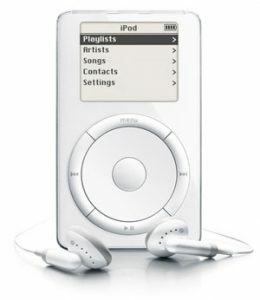 Although they may now seem outdated, MP3 players and iPods were revolutionary. They allowed a person to scroll through a digital library of their music using just their finger, creating what I believe to be a pure and useful TUI. I think Fishkin’s taxonomy was helpful as it described the wide landscape of TUIs and the various environments they fit in. However, I felt that each category within embodiment could be adjusted to include just about any useful tangible object. Because the category is so large, it seems as though almost any item from our current environment has a home on the list. In order to improve this, I think narrowing the scope of what can be included within the embodiment axes of a TUIs taxonomy would be helpful. With regards to metaphors, I agree with Fishkin’s argument that “once parts of an interface are made physically tangible, a whole realm of physically afforded metaphors becomes available (Fishkin, 349). He also goes on a define a metaphor, in a TUI sense, with the precision required of a definition. There’s no ambiguity about what could be classified as a metaphor (when referring to TUIs); there’s a clear “yes” or “no” response to whether “a system effect of a user action [is] analogous to the real-world effect…”(Fishkin 349). This axes and definition helps to narrow the scope of the wide-ranging world of tangible user interfaces.